How designers can use serendipity to improve the design thinking process. Seemingly random encounters and conversations often trigger amazing ideas and discoveries. Maybe it’s talking to a stranger on a train and ending up in a deep conversation. Or meeting new people in your company at lunch and solving a problem together. Or overhearing two people talking in a bar that leads you to join in the conversation. As Horace Walpole defined it in 1754, Serendipity is ‘the faculty of making happy and unexpected discoveries by accident.’ In other words, serendipity is the result of unexpected social encounters, which lead to surprising conversations and discoveries. Serendipity is more than just a happy accident. While we think of serendipity as a series of ‘happy accidents’, if you boil it down, serendipity is the result of social interactions. But they can’t happen on their own. We as individuals need to make the social interaction happen, by putting ourselves in positions to interact, as much as possible, with people we normally wouldn’t talk to. They happen when we break out of our comfort zone. In other words, increasing social interaction leads to more serendipity. And serendipity leads more discoveries. Discoveries become insights, and insights are the building blocks of innovation. While serendipity may seem random, it’s actually a capability, a skill we can develop. If we can increase the rate of seemingly causal random conversations and encounters — social interactions — between designers and customers, and between clients and their customers, it will lead to more frequent insights. We should be able to engineer more serendipity. So how do we intentionally and strategically add more serendipity, and therefore more unexpected discovery, into the design thinking process? 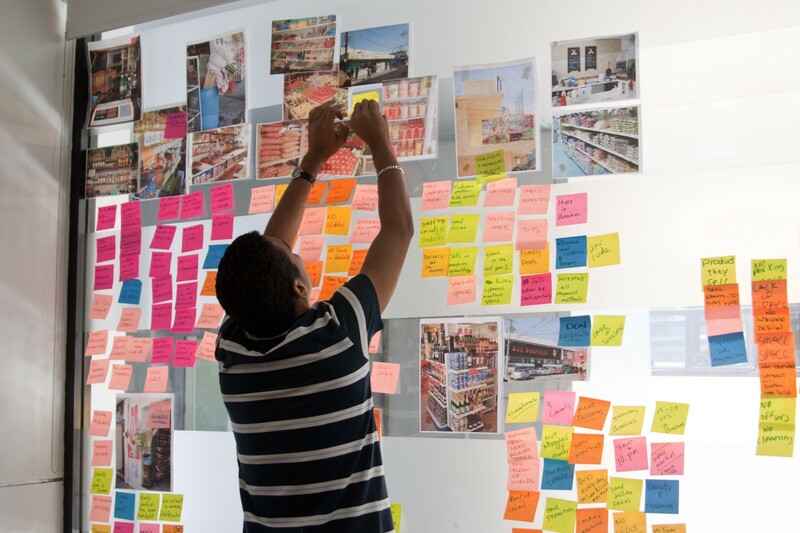 The design thinking process is a structured and very effective methodology that designers and teams use to innovate products and services for clients. Whether you employ the Google Ventures Design Sprint, IDEO’s Human Centered Design, D-School’s design thinking process or your own technique, the design sprint helps us discover, ideate, prototype, and test a solution. In this discovery stage, insights into users’ needs and behaviors are uncovered through observation, structured interviews, and secondary research. These techniques, drawn from social science, are very effective. Yet how does serendipity fit into this process? The funny thing is that our best discoveries (read:insights) often happen through accidental encounters, not just structured discovery techniques. We sometimes get lucky, by being in the right place at the right time. A customer walks in the door of a business we are spending time at, who provides the perfect insight. If we were there five minutes later, would we have found that same insight? Instead of thinking about discovery as a mix of structured techniques and lucky encounters, how might we increase the frequency and quality of these unexpected moments into our design thinking discovery process? We need to expand our understanding of serendipity from simply a series of ‘happy accidents’ to something that can be engineered and baked into our daily lives and organizational processes. Let’s look at examples of how individuals encourage serendipity in their own lives, in their physical environments, and how it can be engineered and promoted within organizations. 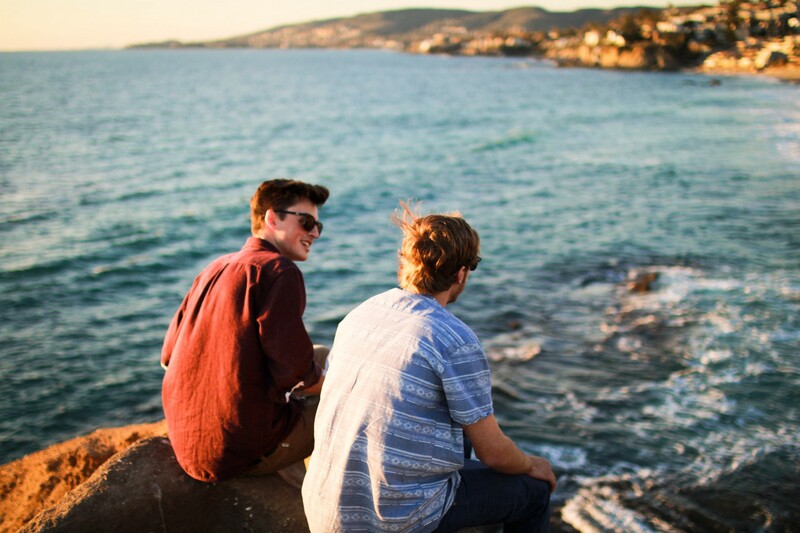 Talk To Strangers — Strike up casual conversations with people around you. Find common ground around simple ideas and see where the conversation leads. Travel Alone — When we go out into the world by ourselves, we often talk to people we don’t know, gloriously wander through the world and end up in situations we didn’t plan for, leading to serendipitous encounters. Break Your Routine — By changing our route to work, or stopping in a different coffee shop or store, we’ll encounter people and places unknown to us, which enhance the chances we encounter fresh people and situations. Go Past Social Networks — Social networks have built in bias, trying to match you with people connected to those you already know, or pairing you with people with shared interests. This can be limiting, as revealing encounters often happen with people you would never match up with. Follow Your Curiosity — When you pass a store you’ve been curious to check out, or a hobby you’ve been meaning to check out, follow your instincts. Your curiosity will lead you to unexpected encounters and situations. Make It a Game — Use games that challenge you to go into your day and try new experiences. 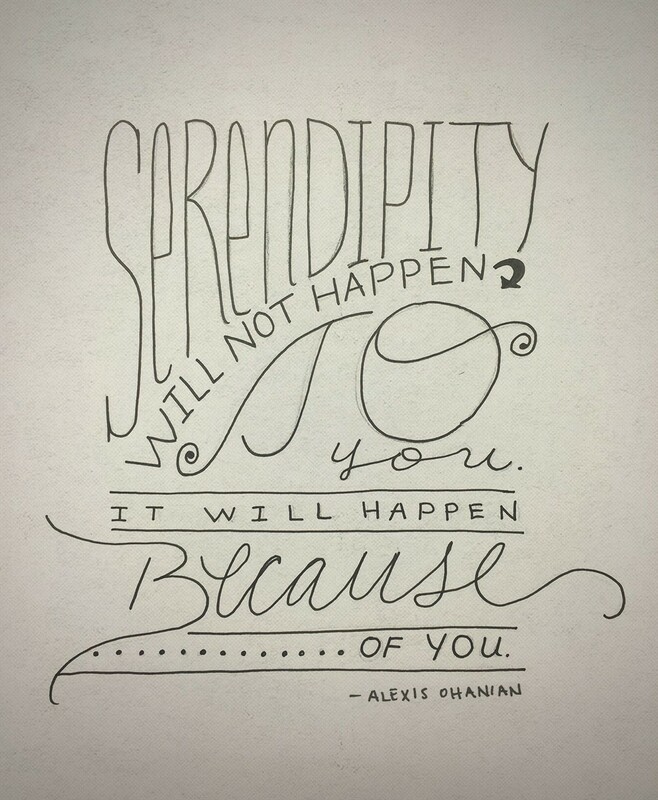 Projects like Serenflipity, a deck of cards that you pull from with ways to encounter new people and situations everyday, are brilliant in encouraging serendipity everyday. There are fantastic examples of physical design techniques that encourage causal, serendipitous conversations. Start with this list of techniques compiled by Michael Soto. Elevators — The Bloomberg building in New York elevator takes you from the ground floor to the cafeteria where you can then switch elevators to other floors. Bathrooms — Apple put restrooms in a single location to drive people towards the same place. Hallways — Architects in some cases are designing narrower hallways, which force people to look up from their devices to avoid bumping into others. Open floor Offices — Tearing down office walls to create a single open space where people can see and bump into each other. Google and Pixar are well known for using data and workplace design to encourage causal collisions and serendipity among their employees. There are well-documented techniques that facilitate collaboration among members of a company or an organization that go beyond reorienting physical shared spaces. In fact, companies like Spark Collaboration have made successful consulting practices out of bringing these techniques within organizations to encourage serendipity and collaboration. -Push 1–1 Interactions — Deliberately push interactions between individuals across team boundaries by bringing people together through events and planned situations. 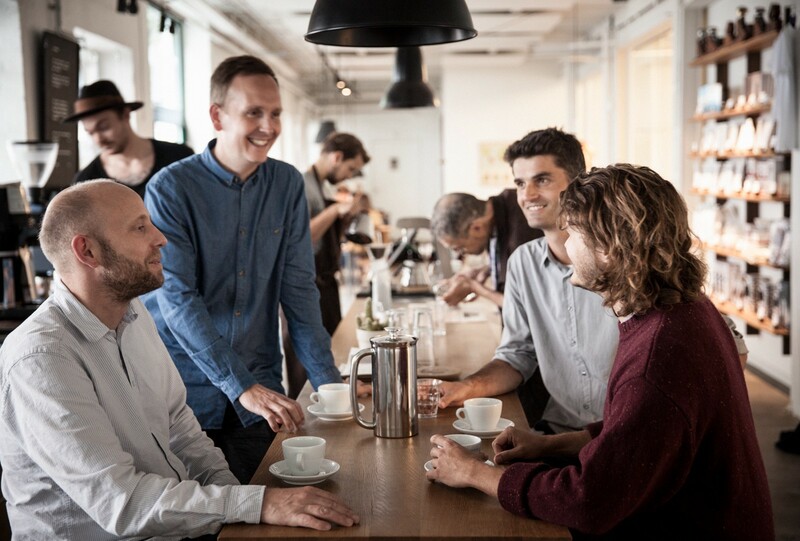 -Organized Casual Encounters — Spark Collaboration pioneered the deceptively simple idea of Random Coffee Trials (RCT), which organize recurring one-on-one interactions and introductions between colleagues. As design thinkers, how might we apply these tactics to put ourselves and clients in a position to discover insights using serendipity? On your next design project, when you start the discovery phase, employ the techniques of personal serendipity to go beyond the structured techniques of observation, interviews, and research. Break out of your comfort zone. Talk to strangers who aren’t primary subject targets. Listen to random conversations among clients and customers. Travel alone to the sites you’re researching. Deliberately spend time in physically shared spaces. If you’re researching a client project to design a better hospital layout to deliver better care to patients, then spend time in unexpected places beyond interactions between patients and hospital staff. Hang out in the staff lunch room and hallways, ride in elevators, stand in lines, all the time striking up conversations with strangers. Beyond the focus within the design process, apply these same techniques outside of the project to your own life, to your commute, to your interactions after work and on the weekend. You’ll be surprised how unexpected conversations often on unrelated topics lead to insights that dovetail back into the discovery process of the project you’re working on. II. Encourage Clients and Their Teams to Become Agents of Serendipity. Let’s get the people we are designing for, both the client, and their customers, engaging in serendipity before moving out of the discovery stage. As design thinkers, bring client teams together who we are engaging with to connect with each other in the discovery phase, encouraging unexpected conversations take place, and then debrief with those people after the fact. 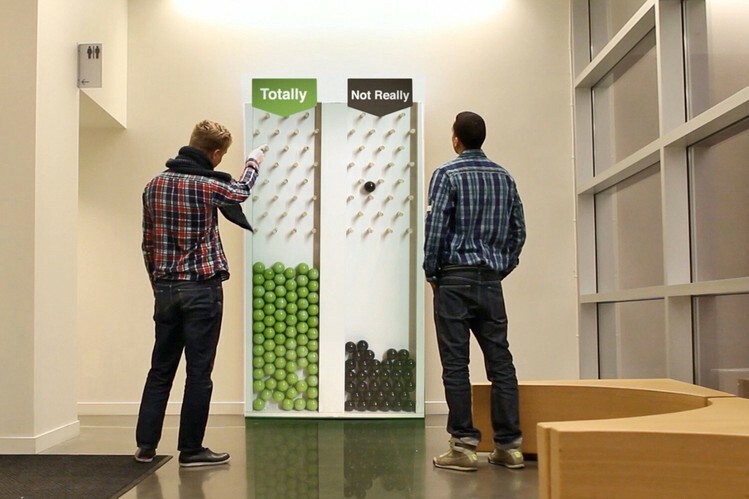 Let’s apply the techniques outlined above to surface insights through serendipitous interactions. Push 1–1 interactions — Have client team members interact with their colleagues across the boundaries of their own groups within their organization. Push customer engagement — Have client team members engage with their customers in new ways. Have team members that normally don’t interact with customers strike up conversations with them. You can identify client team members that are comfortable breaking out of their comfort zones first to set a great example of what’s possible. Organize casual encounters — Schedule coffee meetups or happy hours between team members and team members and customers, where they’ll strike up casual conversations that reveal insights. Setup temporary shared spaces — In client offices and places where customers congregate, setup shared physical spaces where casual encounters can occur. Add shared tables to a lunchroom, plan activities that promote play and cooperation, or put art installations on the walls that encourage people to stop and converse with each other. Encourage gameplay and challenges — Use tools like Serenflipity that challenge client team members to go out an interact with customers or team members in new ways. Have client team members pick random colleagues from the company directory to walk up to and chat with. Have client team members and designers write down the discoveries from the unexpected conversations they have with people, and any original insights that surface in their own minds from those conversations. 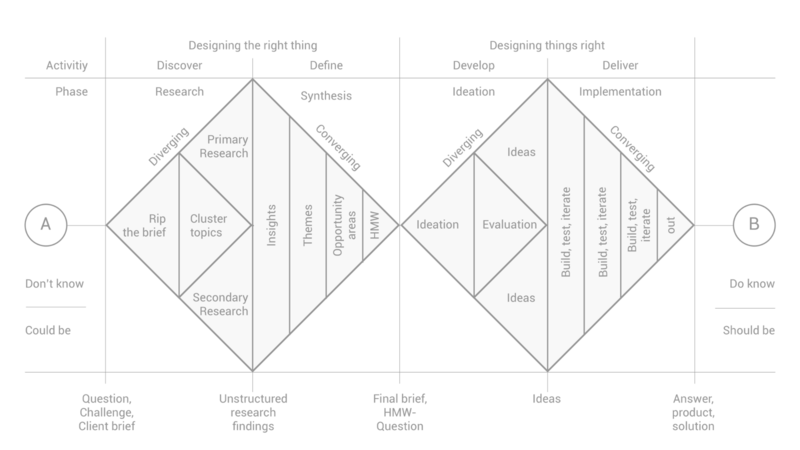 Add these rich insights into the discovery phase of your design process. While serendipity can sometime happen on its own by random occurrence, by baking the techniques for engineering serendipity into the discovery phase of design thinking, you’ll find a treasure trove of unexpected discoveries and insights, within ourselves, and our clients. These discoveries lead to even deeper ideas and innovations, getting us closer to framing the right questions to ask and the right products to build, and moving us faster towards a richer understanding of the people we are designing for.